The American Civil War project continues with a new order off to Pendraken, and perhaps a new game – Altar of Freedom. 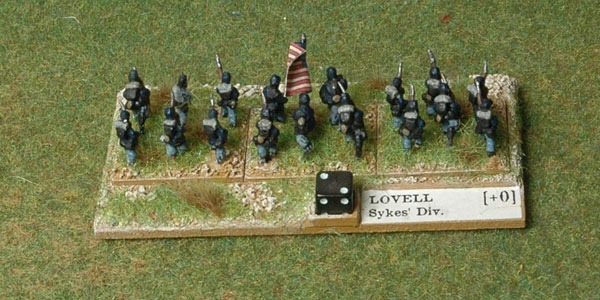 I’ve already got enough Union forces for use in our Longstreet campaign and I’ve ordered enough to enable me to put together Sedgewick’s VI Corps at Gettysburg for Fire and Fury. That will be 4 generals, 63 stands of infantry and 6 stands of artillery. There are several other people from the South East Scotland Wargames Club in this project and we hope to be have enough stuff to refight the whole of Gettysburg using Fire and Fury sometime later this year. But Jim’s eye has been caught by another game, and he’s bought Altar of Freedom from Iron Ivan Games. These rules are army level and they claim to allow you to to “play the biggest battles of the war with multiple players, in one evening, on limited table space.” It sounds like it’s well worth a shot and we can use the 10mm troops we’ve already planned for Longstreet and Fire and Fury. 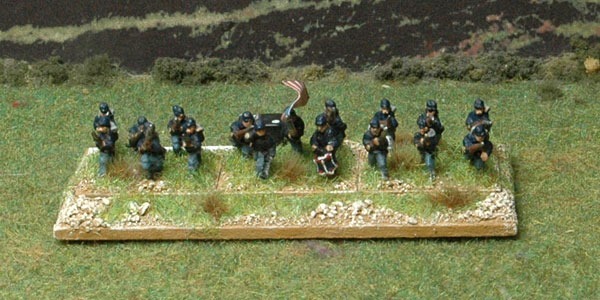 Altar of Freedom is designed for use with 6mm scale but there is a conversion for 10mm in which brigades are represented by a single stand 80mm x 40mm. Jim had some mdf bases this size which he was planning to use for a 15mm Impetus project so I got one of them from him and knocked up a sabot base which would hold three of the 25mm x 20mm stands we are using for our ACW toys. The rules use fatigue points to track the decline in unit effectiveness over the course of a battle so I’ve incorporated a 7mm dice frame for Minibits into the base to making tracking this easy. There’s also space for one of the pre-printed labels provided for use in the game. We’ll be trying out the rules sometime soon and if it’s as much fun as it looks I’ll be making a fair few more of these.